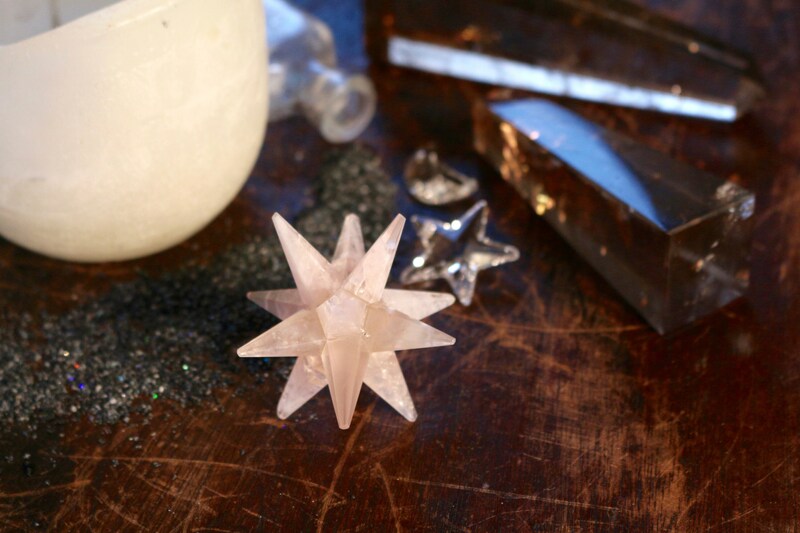 An extraordinary, 12-Pointed Star, utterly handcrafted from 100% Madagascaran Rose Quartz. 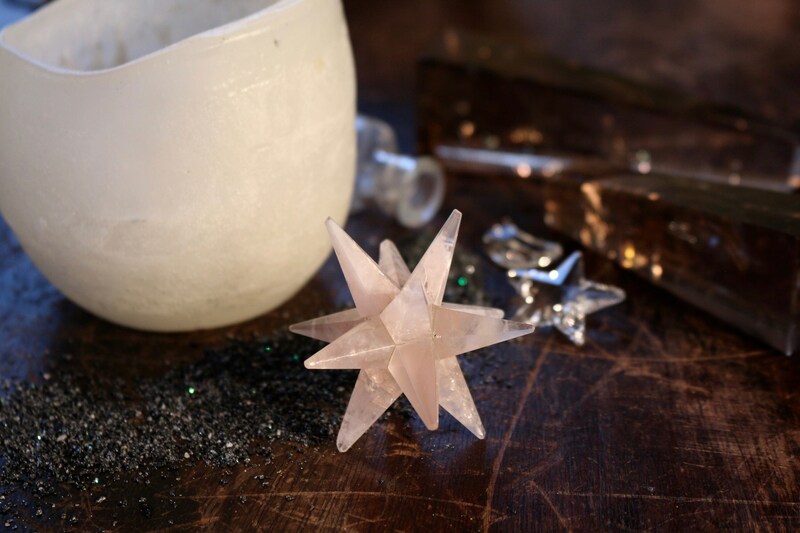 Each 12-Point Rose Quartz Star also referred to as a Rose Quartz Merkaba, is created by hand by joining twelve (12) individually cut and polished Rose Quartz Points. Each point, although similar enough in size and shape, is equally different with varying colors or baby pink, a gemmy translucence and as you turn it, look for the little natural rainbow refractions throughout each little point. 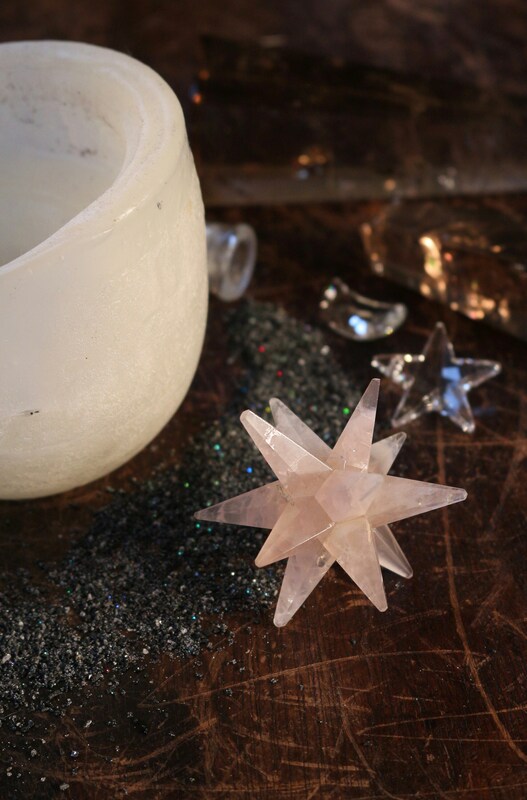 A Mer-ka-ba Star is a unique Sacred Geometry shape, which harnesses the ability to align the mind, body, and heart together. Perfect for Meditation, Energy Work, Reiki Attunement, Aura therapies, and so forth. Indeed the ideal gift for just about anyone! The word Merkaba comes from ancient Egyptian times, with the literal translation Merkaba is broken down into three syllables: “mer” - rotating fields of light; “ka” - spirit; “ba” - soul. In Hebrew, Merkaba means "Chariot" which to many, is a vehicle for ascension. The Merkaba represents the innermost law of the physical world~ the whole relationship between the two complementary halves – the positive and negative, the manifest and the unmanifest, which form a perfect equilibrium. In creation, they rule as two different laws~ the law of spirit and the law of matter. Merkabas are believed to form a spiritual shield around the holder. In upper dimensions, the geometric shape of the human energy field is said to be in the shape of a Merkaba. Thus, meditating with a Merkaba helps us to connect with our higher self.